Notes: Wrexham Central Station became the southern terminus of the Wrexham, Mold & Connah’s Quay Railway (WM&CQR) when it opened its extension into the centre of the town on the 1st of November 1887. The WM&CQR had originally opened between Wrexham & Buckley for goods services on the 1st of January 1866 and for passenger services on the 1st of May 1866. The line made an end on connection with the Buckley Railway just to the north of Buckley Station which provided a through route to Connah’s Quay on the River Dee. One of the primary objectives of the WM&CQR was to provide a means of taking coal and other products northwards towards the coast for onward shipment. The original passenger terminus at the Wrexham end of the line was located on the west side of the Great Western Railway (GWR) station, Wrexham General, which had opened in 1847. Both stations were about half a mile to the west of the centre of Wrexham. Central Station was provided with one platform. The station facilities were located in a basic timber built building. Goods facilities were located to the west of the station. At the time of opening Wrexham Central had six trains per day that ran to Buckley. In 1888 the line between Wrexham Central and Exchange became double track. From the 1st of August 1889 a passenger service began to operate between Wrexham Central and Brymbo following the opening of a new line to that place. Four trains ran between Central and Brymbo on weekdays but extra services ran on Saturdays. In 1891 there were still four trains on weekdays but the Saturday service included six extra trains into Wrexham Central from Brymbo with eight return workings the last leaving Wrexham Central for Brymbo at 10.05 pm. 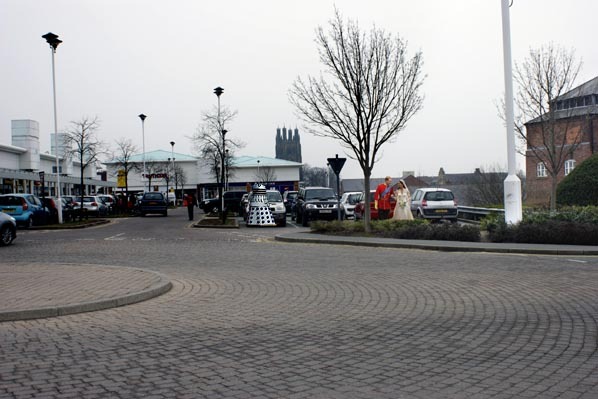 The service proved very popular with Brymbo residents who travelled into Wrexham for shopping trips and particularly on Saturday afternoons to visit the pubs of the town. So popular with Brymbo residents did Saturday evening trips to Wrexham become that a Policeman had to be deployed at Wrexham Central Station on Saturday evenings to ensure that the drunken crowds got onto the Brymbo trains and thereby got out of Wrexham. built a new line from Buckley Junction, to Connahs Quay and Shotton via Hawarden. The line was known as the Hawarden Loop and work started on it had started on the 6th of September 1887. The MSLR built a line from Chester to Connahs Quay & Shotton thereby creating the through route. The WM&CQR and the MS&LR were thus able to compete with the Great Western Railway (GWR) who had had a line between the two centres since 1846. With the opening of the through route Wrexham Central began to be served by four through trains each weekday that ran between Chester and Wrexham Central. These services were hauled by MS&LR locomotives. The WM&CQR also operated services between Wrexham Central and Connahs Quay & Shotton. Longer distance express services also operated to Manchester Central. These trains were operated by the MS&LR and beyond Chester they used the Cheshire Lines Committee (CLC) route to Manchester. In 1895 Wrexham Central station was substantially rebuilt to serve a new line that opened between Ellesmere and Wrexham Central on the 2nd of November 1895. Plans for a line between the two towns had been an aspiration since the early 1860s. The WM&CQR had even obtained an Act to build a line on the 25th of July 1864 and in 1866 they began to actually build it but a financial crisis brought an end to the project. On the 31st of July 1885 the Wrexham & Ellesmere Railway (W&ER) was incorporated to build the line. The company was to be backed by the WM&CQR, the MS&LR and the Cambrian Railway (CR). Once again there were financial problems and no work had started by February 1888 when an extension of time had to be applied for or the Act would lapse. In 1891 there was a proposal to fund the W&ER by the GWR, MS&LR and the CR. The GWR dropped out and work finally began on the line on the 11th of July 1892 with financial backing from the CR and the MS&LR. link between the two through platforms. On the north side of the station site, close to the town there was a single storey wrought iron building which contained storage areas. Between platforms 2 and 3 there was a single storey timber built building which contained the booking office and waiting facilities. On platform 4 there was a single storey timber built waiting room and at the eastern end there was a signalbox. From the start the station buildings had a temporary air about them and it was the intention that they would be replaced by something more substantial but that never happened. By 1895 the goods facilities to the west of the station were quite substantial and included a large brick built goods shed, numerous sidings, a cattle dock, pens and a 2-ton crane. A single-road engine shed with a turntable was built west of the station and south of the goods shed by the Wrexham & Ellesmere Railway, opening on 2.11.1895. It was worked by the Cambrian coming under the control of the GWR on 1.1.1923. The shed closed in 1925 and a year later it was taken down and moved to Aberayron, where the shed had burned down, also in 1925. On the 2nd of July 1895 a special excursion was run from Wrexham to Ellesmere and back for a church outing. 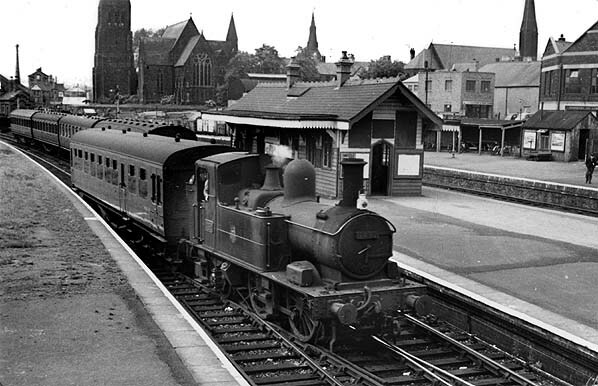 The excursion was the first passenger train that departed from Wrexham Central for Ellesmere and it ran even before the Board of Trade inspection had taken place. change at Wrexham Central. The CR services terminated at one of the through platforms. From the 18th of May 1896 passengers using Wrexham Central were able to travel to Liverpool. They were able to do so because a line that had been jointly sponsored by the WM&CQR and the MS&LR had opened between Hawarden Bridge and Bidston. Bidston was on the Wirral Railway (WR) and through agreement with them services from Wrexham were, after 1898, able to run to Seacombe from where a ferry operated to Liverpool. The building of this new line effectively bankrupted the WM&CQR and the receivers were called in. On the 1st of August 1897 the MS&LR changed its name to the Great Central Railway (GCR). In 1900 the GCR ran a through service over the Ellesmere line. It departed from Wrexham Central at 11:18 am and went to Aberystwyth but in October of that year they withdrew the Manchester Central express services. There were seven Seacombe services, four Brymbo services, one service to Hawarden and five Ellesmere services on weekdays. There were additional Brymbo services on Saturdays and Monday’s. Passengers for Chester changed trains at Connah’s Quay for Shotton at this time. On the 1st of January 1905 the GCR formally took over the WM&CQR. They had been in control of the line since the receiver was called in so in reality there was little change other than the remaining WM&CQR locomotives were hurriedly repainted in GCR livery. The GCR introduced a ‘Railmotor’ onto its Brymbo service in 1905 in a bid to win more passenger traffic. With effect from the 1st of March 1917 the Brymbo service was withdrawn. Competition from the GWR and from new bus services had made in unviable. Passengers were still able to travel from Wrexham Central to Chester, Seacombe and Ellesmere. On the 1st of July 1922 the W&ER and the CR who operated the train services on the line were both absorbed into the GWR. On the 1st of January 1923 the GCR was absorbed into the London & North Eastern Railway (LNER). Wrexham became the most westerly point on the LNER network. The LNER continued to operate services to Seacombe and to Chester. The GWR operated the Ellesmere service. The GWR introduced ‘push and pull’ trains onto the Ellesmere service and they ran eight services in each direction on weekdays. An additional service ran on Saturdays. six to Chester and eight to Ellesmere. With regards to the pattern of services at Wrexham Central very little changed in the first decade of nationalisation. In February 1958 there were eight weekday trains to Ellesmere and eight return workings. The first departure for Ellesmere was at 7.40 am and the last was at 9.00 pm. There was no Sunday service to Ellesmere. There were five weekday trains to Chester Northgate with two extra workings on Saturdays. 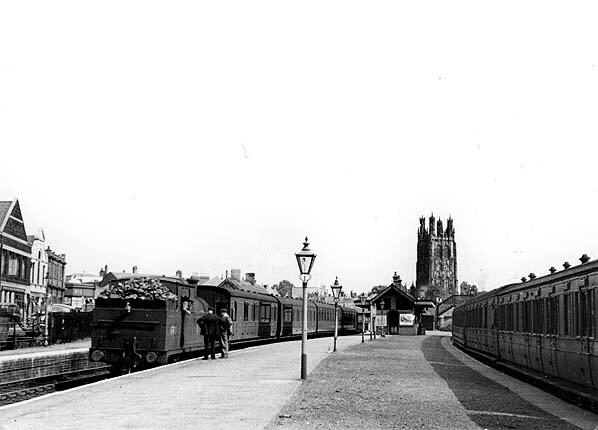 Three services ran to Chester Northgate on Sundays. Ten trains ran to Seacombe between Monday and Friday which increased to eleven on Saturdays. Only one train ran to Seacombe on Sundays. There was also a single service on weekdays that ran only to Hawarden Bridge. It left Wrexham Central at 7.00 am. On Sundays there were two trains that ran to Hawarden Bridge. With effect from the 4th of January 1960 the Seacombe trains were diverted to run to New Brighton. The Ellesmere service was withdrawn with affect from the 10th of September 1962. The last passenger trains ran on Saturday the 8th of September. Hundreds of people took the opportunity to ride the line for the last time. The very last train departed from Wrexham Central at 9.00 pm. It had to be strengthened to four coaches so that it could carry the 200 hundred people who had booked tickets to ride it. After the passenger service had ceased the route to Ellesmere closed completely from Pickhill Halt to Ellesmere. Goods services continued to pass through Wrexham Central heading eastwards put for passenger services the station reverted to being a terminus. The remaining services that ran to Chester Northgate and to New Brighton went over to DMU operation in the early 1960s but occasional steam workings did operate from time to time. The ‘Reshaping of British Railways’ report of 1963 (The Beeching report) recommended that Wrexham Central should be closed to passengers and the services to Chester and to New Brighton be withdrawn. two trains that ran only as far as Hawarden Bridge. The first weekday departure in the Summer of 1964 was for New Brighton at 5.05 am. The last was for Chester Northgate at 9.43 pm. 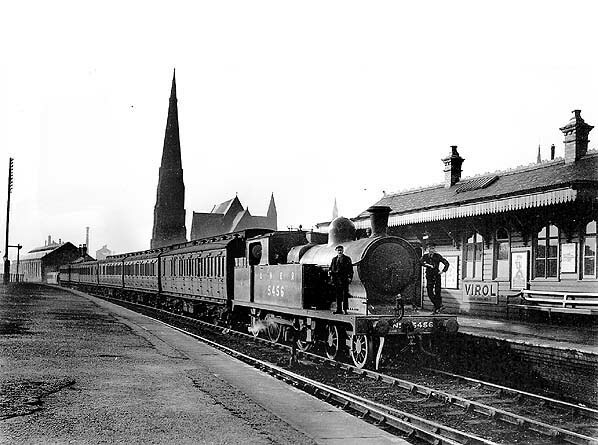 There was a later train to Chester Northgate on Saturday evenings which departed at 10.50 pm. There was very late arrival from Chester Northgate that arrived at Wrexham Central at 12.17am. The goods depot closed on 7th December 1964 and closure of the station was threatened in November 1965 but a storm of protest led to a reprieve. The May 1968 timetable showed ten Monday to Friday services to Chester Northgate with sixteen on Saturdays. Five trains ran to Chester on Sundays. There were twelve trains to New Brighton Monday to Saturday and eight on Sundays. Two services ran to Hawarden Bridge on Sundays. The first weekday departure was still the 5.05 to New Brighton and the last was still the 10.50 pm to Chester Northgate. The late night Saturday services to and from Chester also still ran. In March 1968 the withdrawal of the service to New Brighton was deferred by the Transport Minister Barbara Castle MP. However approval for the withdrawal of the Chester service was given the go ahead and the last Chester Northgate trains departed from Wrexham Central station on the 9th of September 1968. With effect from Sunday the 20th of April 1969 Wrexham Central became an unstaffed halt. The buildings were demolished and the track was lifted from platforms 1, 2, 4 and 5. The station was reduced to a single platform terminus halt with platform 3 being the only part of the station to survive. A simple bus shelter style waiting facility was provided on the platform. Shotton only that ran on Saturdays. The last arrival on weekdays was the 11.51 pm from New Brighton. On Saturdays the last New Brighton train reached Wrexham Central at 12.21 am. The service was basically hourly throughout the daytime on weekdays. On the 4th of January 1971 the New Brighton service was diverted to run to Birkenhead North between Monday and Saturday. Sunday services continued to run to New Brighton. The Ellesmere line was cut back further in December 1971 when the section beyond Marchwiel fell out of use. In May 1973 it was cut back to Abenbury siding. The station became unstaffed on 7th February 1972. 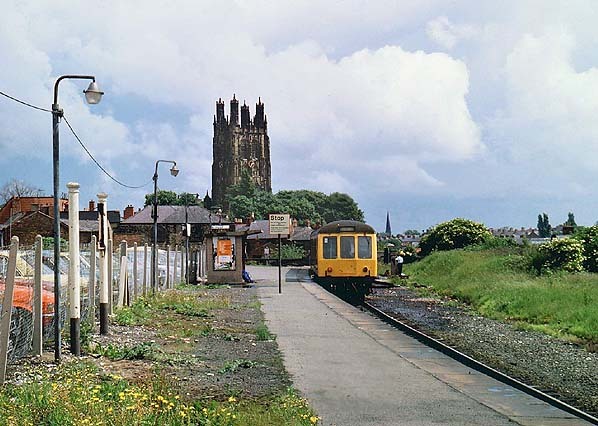 On the 11th of January 1976 the Sundays only service to New Brighton was diverted to run to Birkenhead North. By May 1977 there were twenty two Monday to Friday trains that ran to Birkenhead North with nineteen on Saturdays and four on Sundays. The first Monday to Friday departure was at 5.15 am and the last arrival was at 11.56 pm. On Saturdays there was an arrival at 12.16 am. There were only four trains on Sundays. between Monday and Friday and at 7.01 am on Saturdays. The last arrival from Bidston was at 10.38 pm but a later service from Bidston did run to Wrexham General. Four trains operated on Sundays. The last goods trains had run through Wrexham Central to Abenbury Siding in May 1981 and the line was closed and lifted. Buffer stops were erected at the west end of the platform. The route of the line to the east through Wrexham was on a stone built viaduct and it was demolished in the 1980s. In 1988 a signalbox to the east of the station of GCR vintage was threatened with demolition. It was saved by the Great Central Railway Heritage line who took it away to be re-used at Birstall in October 1988. 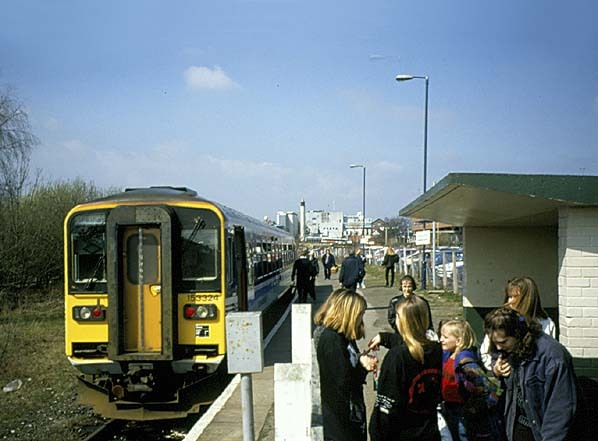 A very run down and decrepit Wrexham Central continued to be served by an hourly train service to Bidston throughout the 1980s and into the 1990s. On the 1st of April 1994 the British Rail network was privatised and Wrexham Central became part of Railtrack. Its passenger services were operated by North West Trains. Between 1960 and 1970 passengers could travel direct between Wrexham Central and New Brighton on weekdays and for a few years after 1970 on Sundays. The journey could still be made in 2011 but involved two changes of train. In the 1990s proposals were put forward to develop the site of Wrexham Central station as a shopping centre and to create a new Wrexham Central further to the west. 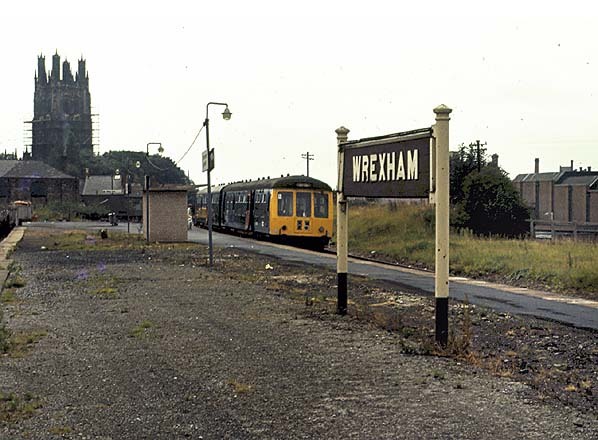 Despite opposition as passengers would have to walk further to the town centre the proposals where given the go ahead on the 6th of May 1997 when the Rail Regulator agreed that Wrexham Central could be closed. Wrexham Central closed on the 23rd of November 1998 and a new station that was also called Wrexham Central opened further to the west. The line was lifted and the last surviving parts of the station were demolished. A shopping centre and car parks were built on the station site. The Wrexham & Minera Railway article in Railway World, Rex Christiansen – Feb 1987. See also: the Penmorfa web site for more on the Wrexham - Bidston line. Ticket from Michael Stewart, route map drawn by Alan Young, Bradshaw from Chris Hind. Looking west at Wrexham Central station in April 1939. The train would have arrived from either Seacombe or Chester Northgate.Loco No 5456 was an LNER class C13 4-4-2 tank, designed by Robinson for the GCR. Built in 1905 at GCR Gorton Works, it carried this number until LNER renumbering in 1946 when it was renumbered 7433. The loco passed into BR ownership in 1948 and was renumbered again to 67433. Withdrawn on 31.1.1958 from Ardsley shed, 37A, it was finally cut up at Gorton Works in February 1959. Looking east along platforms 2 and 3 at Wrexham Central station in August 1953. To the left is platform 2 which was a terminus platform. The train waiting to depart would have been for Seacombe or Chester Northgate. The coaches to the right were standing at platform 3 which was a through platform. They would also have been part of a Seacombe or a Chester Northgate train. Looking west from the station footbridge in June 1956 at Wrexham Central as an Ellesmere 'Autotrain' crosses from platform 4 to platform 3. It is likely that the train arrived at platform 4 because platform 3 was occupied. It then would have moved to platform 3 for its next scheduled departure. Looking east along Wrexham Central station's platform 4 which was a through platform. An Ellesmere service autotrain can be seen standing under the footbridge. Ellesmere services arrived at Wrexham Central from the east and terminated at the station. Seacombe and Chester Northgate trains arrived from the west and also terminated. In 1956 only goods trains ran through the station. 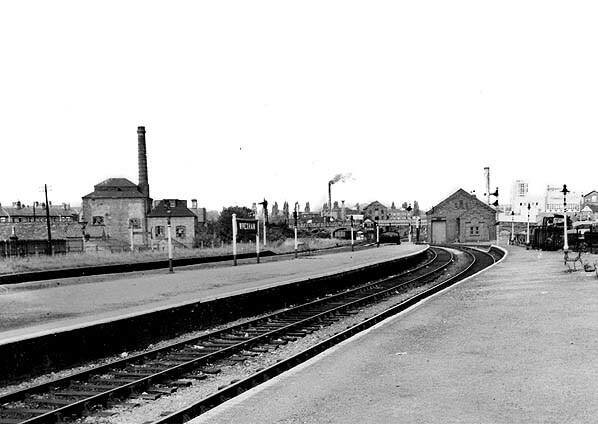 Looking west from the east end of platform 1 at Wrexham Central in the 1960s. In the distance can be seen the stations goods facilities including a large brick goods shed. The goods yard closed in 1963. The building on the left is the Island Green Brewery which was never rail connected. The Grade II listed building has now been converted for residential use. 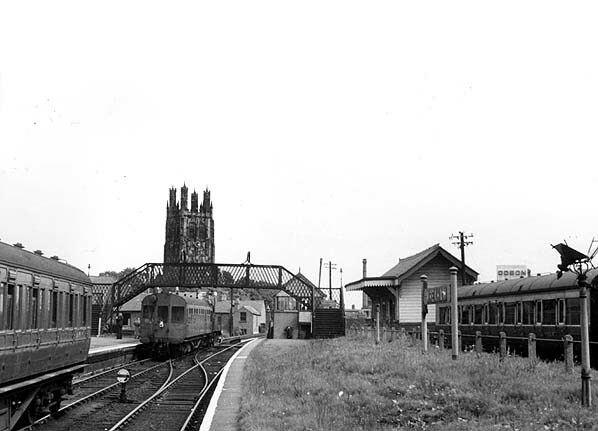 Looking west from the east end of Wrexham Central station's platform 4 in August 1970. 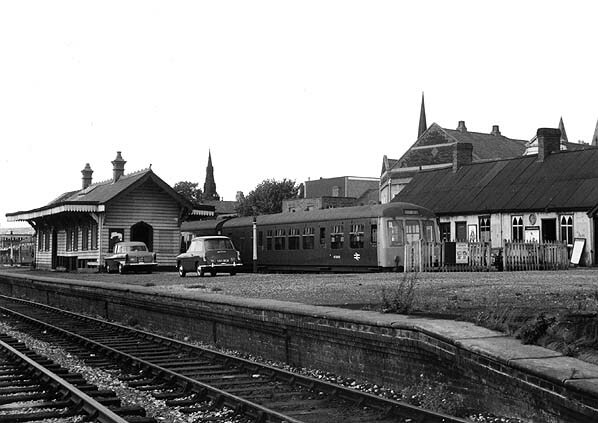 With the exception of the footbridge which had been demolished, the station still retained all of its buildings at this time although they were in a state of disrepair. The only train service that operated at this time was the service to New Brighton. Wrexham Central had become run down and neglected when this view looking east was taken in August 1973. The station had been reduced to a single platform halt only the former platform 3 remaining in use. The station did still retain its original sign though. A two car Derby built DMU can be seen waiting to depart for Birkenhead North. Wrexham Central Station in June 1980. Although the station remained open for a further 18 years it was already looking very shabby. The station name board seen in the 1973 picture above has gone and the other platforms are now a car park. Looking west along what had been Wrexham Central stations platform 3 in August 1996.
looking east at the site of Wrexham Central Station in March 2011. The through line platforms, numbers 3 and 4 were to the right and the terminus platforms, 1 and 2 were to the left and extended right up to the buildings in the distance. The former Island Green Brewery is seen on the right.